I'm not usually a fan of turning movies into musicals, but when Jason Robert Brown is the composer, I'm on board. 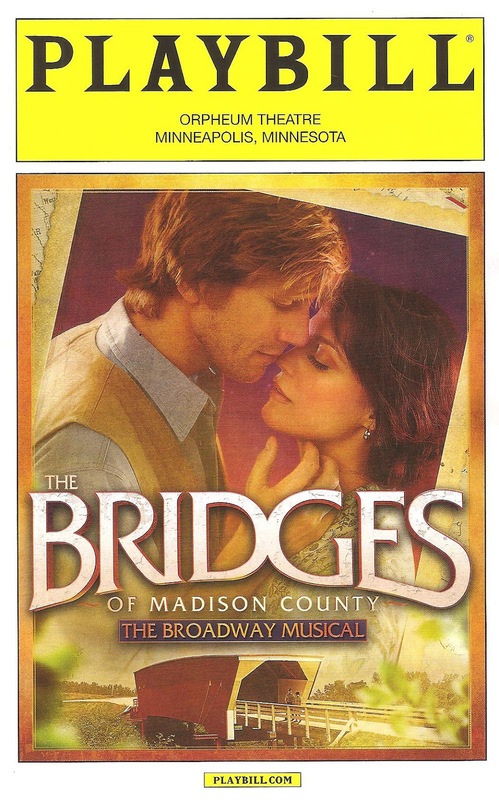 I've been listening to the exquisite cast recording of the 2014 Broadway musical The Bridges of Madison County (adapted from the 1992 best-seller novel by Robert James Waller and the 1995 movie) since hearing a few songs at Musical Mondays last month, and I'm obsessed. It was a thrill to hear this gorgeous score live and watch the story play out around and through it, a story of impossible but life-changing love. The show inexplicably ran only a few months on Broadway, but lucky for us the first national tour is stopping at the Orpheum Theatre this week. 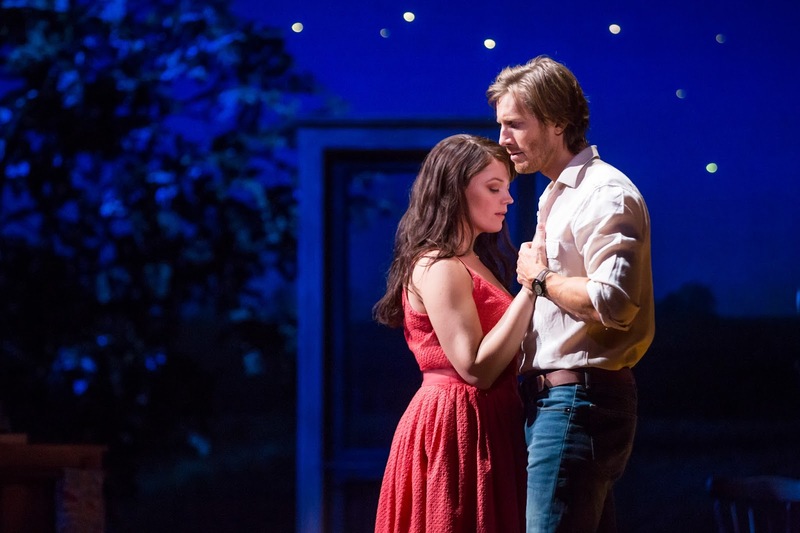 If you're a fan of music-theater, or just music in general, go see the show to experience one of the best scores coming out of Broadway in recent years, wrapped up in a sweeping romance. The setting is rural Iowa in 1965 Iowa. Francesca has lived there for nearly 20 years, after marrying an American soldier as a way to escape her hometown of Naples, Italy after the destruction of WWII. She's built a good life for herself and her family, which includes two children, but something is missing. Which is where "hippie" photographer Robert Kincaid comes in. She meets him while her family is away showing the prize steer, and they embark on a whirlwind romance that is doomed from the start. But as they say, "just because something ends doesn't mean it wasn't successful. 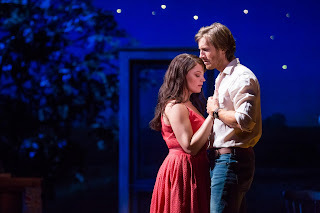 *" The musical adaptation adds a few layers to the story from the novel and the movie, telling us more about the town and Francesca's family, but this brief but life-changing love story is still the heart of the piece. Now that the obligatory plot summary is out of the way, let's talk about this luscious music. Jason Robert Brown won the Tony not just for the score but also the orchestrations, and deservedly so. He seamlessly combines several musical styles, including the Italian sound of Francesca's homeland, folk/country tunes fitting to the rural farm setting, and sweeping love ballads. The melody lines are surprising, the harmonies lush, the orchestration ranges from a few stirring a capella lines to a simple cello opening the show to the full orchestra with guitars and strings, and the music and lyrics really show you who these people are. In a word, the score is flawless. And it's helplessly, hopelessly romantic. In a note from Mr. Brown, he says "I felt myself sometimes butting up against the corny, the cheesy, the sentimental, but I decided in those moments to push harder through it, not to be cynical about love or family but to sing about them with ecstatic truth." Mission accomplished. The Bridges of Madison County is essentially a fairy tale for adults, and Mr. Brown's music and lyrics almost make me believe in fairy tales. Speaking of flawless, the original cast featured Kelli O'Hara and Steven Pasquale, whose voices have been filling my ears for the past month. Those are big shoes for a touring cast to step into (not to mention those of Meryl Streep and Clint Eastwood), but Elizabeth Stanley and Andrew Samonsky do so beautifully. Elizabeth has a lovely voice and embodies Francesca's pull between love of family and love of this man who dropped unexpectedly into her life. Andrew is tall, lanky, and dreamy, and gorgeously sings these gorgeous songs of love and longing. They are surrounded by a fantastic ensemble playing many roles and constantly moving in and out of the scenes, often pushing set pieces, sometimes sitting on the side of the stage (because in a small town, someone's always watching). 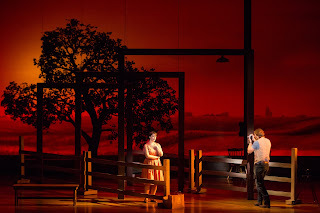 The staging and set design fit well with the dreamy and romantic story and music. 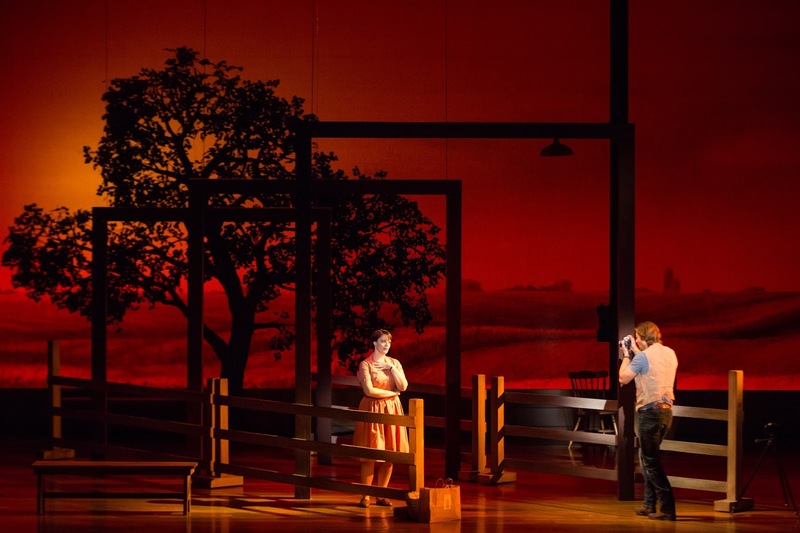 The basic set is a backdrop of the beautiful Iowa cornfields, a large and leafy tree, and a pole with a yard light. Onto this canvas are added set pieces that sparsely sketch out the farmhouse, the bridge, or the fairgrounds, set pieces that are moved in and out and around by the cast, sometimes representing more than one location at once (direction by Bartlett Sher, scenic design by Michael Yeargan). The Bridges of Madison County continues through June 26 (a few discount tickets remain on Goldstar). *"Just because something ends doesn't mean it wasn't successful" is a quote from playwright Philip Dawkins' one-act play Failure: A Love Story. Go see his fantastic new play Le Switch at the Jungle for another sweeping romance!